Scientists have studied and been captivated by the organization and functioning of social insect colonies since Charles Darwin (1809-1882) investigated beehives near and at his home in Kent with the help of his five children. Since then, prompted by the theory of evolution, researchers have scrutinized every conceivable aspect of the life of bees. Decades ago, scientists discovered that in the nests of many species of European honeybees (genus Apis), in which healthy young queens regularly lay eggs, the queen uses chemical compounds called pheromones to inhibit worker reproduction. As a result, the workers will have to care for the queen's offspring instead of their own. If the queen is old, falls sick or dies, causing the supply of queen pheromone to cease, specialized workers rear new drones that will fertilize the eggs destined to become future queens. "An important part of studying social insects is understanding how they resolve conflicts inside the colony, especially reproductive conflicts of interest. In some bee species, workers can produce drones, but this adaptation may create a conflict between the queen and the workers over who rears the drones," said biologist Túlio Marcos Nunes. Nunes did his postdoctoral research at the University of São Paulo School of Pharmaceutical Sciences and is first author of a paper published in the journal Nature Ecology & Evolution, describing a study that set out to discover whether this adaptation is also found among the 600-odd species of stingless bees (tribe Meliponini) widely distributed in tropical and subtropical regions of the world. "The conflict is due to the differential genetic relationship between the offspring of the queen and the workers. From the evolutionary standpoint it's more worthwhile for workers to produce their own offspring [to which they are 50% genetically related] than raise the queen's offspring [with which they share only 25% of their DNA]," Nunes said. Nunes's supervisor, Norberto Peporine Lopes, heads the Center for Research on Natural & Synthetic Products and is the principal investigator for the Thematic Project "Distribution and metabolism of natural and synthetic xenobiotics", supported by The São Paulo Research Foundation (FAPESP). Peporine Lopes explained that the purpose of the study was to see whether the behavior observed – workers not laying eggs in the presence of a queen – is positive for workers in genetic terms. "If this behavior is negative for workers – if they achieve a greater genetic return by laying eggs and are chemically prevented from doing so – then we're talking about a castration pheromone," He said. European honeybees are a clear example of chemical castration. 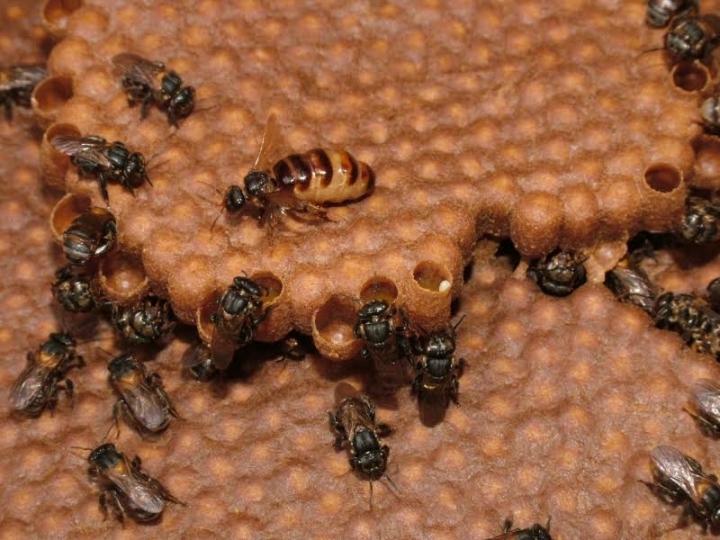 In this study, the researchers wanted to find out whether, in the case of stingless bees, queen pheromones chemically sterilize workers or merely signal the queen's presence. They worked with 23 stingless bee species, a few of which were present in FCFRP-USP's stingless bee apiary (a "meliponiary"). Nunes collected others in the wild from sites in Brazil and Australia. Stingless bee colonies are usually found in the trunks of living trees or hollow tree trunks on the forest floor. He had to open the tree trunks, locate the colonies and transfer them to boxes for transportation. "They don't have stingers, but they defend themselves by biting, depositing resin, and, in some species, expelling highly concentrated formic acid," he said. The 23 species studied were divided into three categories: those with sterile workers that never lay eggs (four species), those with workers that always lay eggs even if a queen is present (14 species), and those with workers that lay eggs only if the colony is queenless (three species). In the latter species, workers respond to the queen's presence by not activating their ovaries. The study was conducted on two fronts. First, the researchers set out to understand how workers' reproductive behavior evolved in the presence or absence of a queen. Then, they sought to find out which chemical compounds signaled the queen's presence to workers. The reproductive behavior of workers in 21 species was known from the scientific literature. New investigations of two species, Lestrimelitta limao and Plebeia minima, determined the frequency of worker ovary activation in three colonies of each species, with and without queens. The behavior of fertile workers in the presence of a queen was observed every day for three months. The queen was then removed and observation continued for another three months. "When we removed the queen, the workers started to lay," Nunes said. The researchers also analyzed the cuticular hydrocarbons produced by the queen – pheromones used for chemical signaling to workers – and identified 128 different chemical compounds. "Cuticular hydrocarbons are pheromones or chemical signalers. They are non-volatile waxes and don't disperse in air. We succeeded in mapping the locations of these substances in the queen's body. They are mainly found in the head. Hence our conclusion that chemical signaling between the queen and fertile workers can only occur via physical contact," Peporine Lopes said. In three species – Friesella schrottkyi, Leurotrigona muelleri, and Plebeia lucii – fertile workers began laying eggs when the queen was removed. "The conclusion was that workers of these species were not chemically castrated by the queen," Peporine Lopes said. "The chemical signals emitted by the queen inhibit worker oviposition." According to Nunes, they next mapped the reproductive behavior of workers during the evolution of the species concerned in order to analyze the ancestral traits of stingless bees in this respect. "We inferred from this analysis that modulation of worker sterility in response to queen pheromone [signaling the queen's presence] evolved independently at least three times in the lineages leading to F. schrottkyi, L. muelleri and P. lucii," he said. "In my opinion, what's important about this study is that it establishes a counterpoint to the traditional view of forced worker castration by the queen," Peporine Lopes said. "That's why we were able to publish it in a Nature research journal."